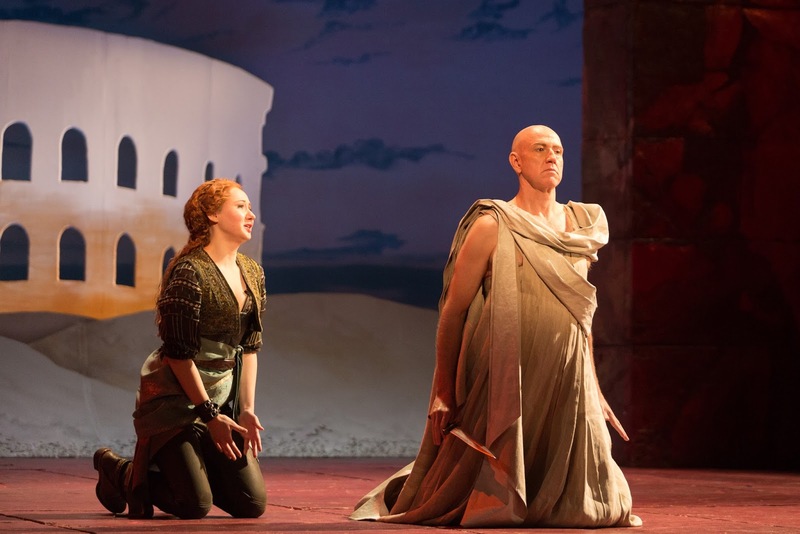 So says Tazewell Thompson in his director's essay on the Glimmerglass Festival production of Vivaldi's Cato in Utica, thought to be the U.S. premiere of this opera. In addition to the instrumental and church music for which Vivaldi is celebrated today, he was also a successful composer and producer of opera. 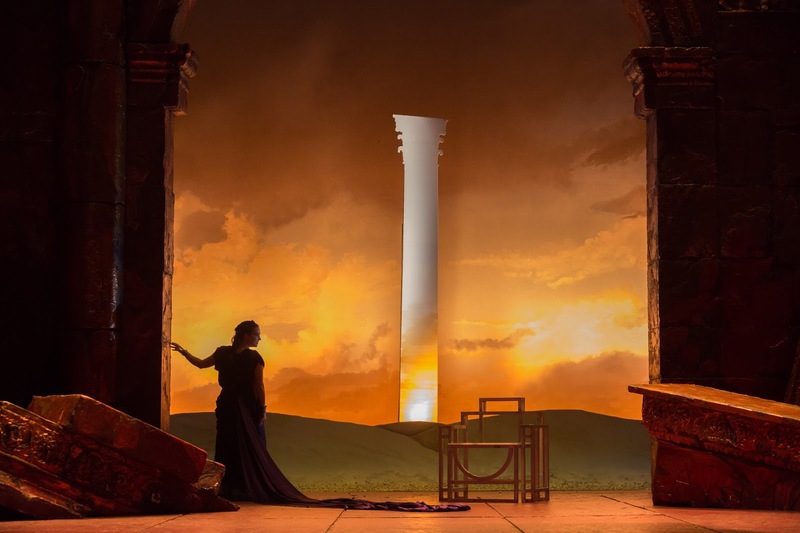 Glimmerglass Artistic Director Francesca Zambello has expressed a fascination for the abundance of town names from the ancient world found in upstate New York, and producing an opera that takes place in nearby Utica seemed inevitable. On Saturday night I attended the first performance. The typically convoluted story centers around the rivalry between Caesar and Cato, the last remaining senator to oppose Caesar's grab for power. There is intrigue—Pompey's widow Emilia is obsessed with vengeance—and ill-fated romance. Just pick a character and you'll find he or she suffers from unrequited or thwarted love. I had to read the synopsis four times, including once aloud, before I could grasp all the characters and how they relate to each other, but seeing it on stage made it all more clear. 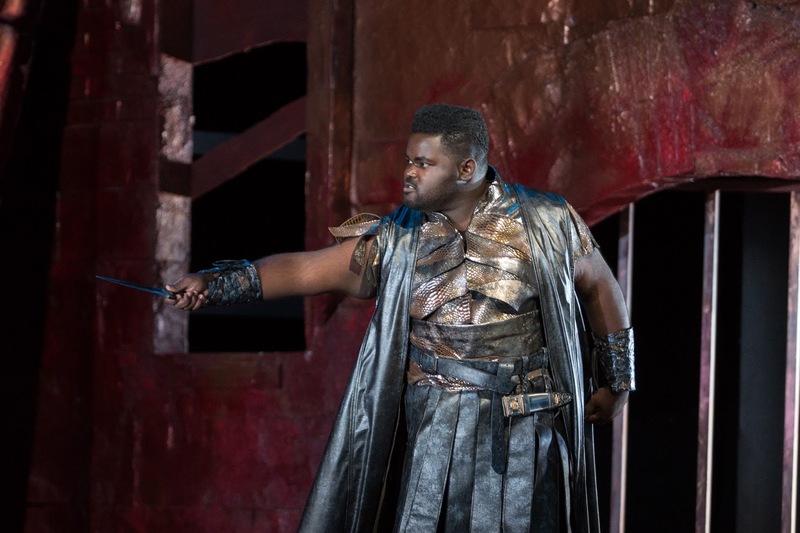 The star of the show was the Caesar of countertenor John Holiday. His voice is high but never shrill, and his pyrotechnics are beyond compare. He sang with great passion and tenderness, and commanded the stage easily with his enormous presence. He impressed especially with arias like the angry and florid Dovea svenarti allora. I adored the three women in the cast—Sarah Mesko as Emilia, Pompey's vengeful widow; Allegra De Vita as Fulvio, Caesar's aide, who loves Emilia; and Megan Samarin as Marzia, Cato's daughter, whom he has promised to Arbace, but who loves Caesar. Miss De Vita and Miss Samarin are both Glimmerglass Young Artists. All three young women sang beautifully from bottom to top of their quite extensive ranges, all sang Vivaldi's challenging coloratura with ease, all conveyed their characters' turbulent emotions quite well. Thomas Michael Allen sang Cato and Glimmerglass Young Artist Eric Jurenas sang Arbace, both rather well. Conductor Ryan Brown led the Glimmerglass Festival Orchestra in beautifully stylized playing of the Baroque score. Quite striking sets were by John Conklin and beautiful costumes were by Sara Jean Tosetti. My only real complaint about the production is not a valid complaint. This is early opera, without 19th-century conventions of plot movement. 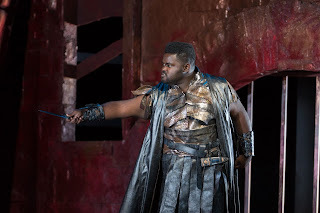 Typical of its time, there is a lot of introspection, revelation, and commentary through vocal fireworks, but there isn't much story telling--and I can't say this opera has a very strong story to tell. But consider that the audience experience in the early 18th century was nothing like today's reverential experience--it would have been much more social, with many diversions during the performance itself. Do I recommend this production? Of course I do. The singing alone is worth the trip.